Solid waste processing in Ireland is done in different plants. 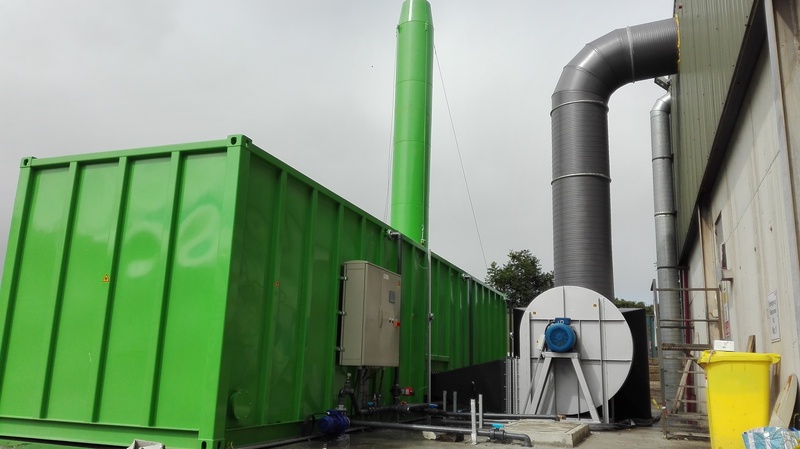 Some of these recycling plants are located near urban areas and EPA (Environmental Public Authority) can insist on implementing an Odour Control System to minimize the odour nuisance caused by the recycling process. For this purpose, IPEC NV has developed an odour control system to abate the odour from solid waste recycling plants. 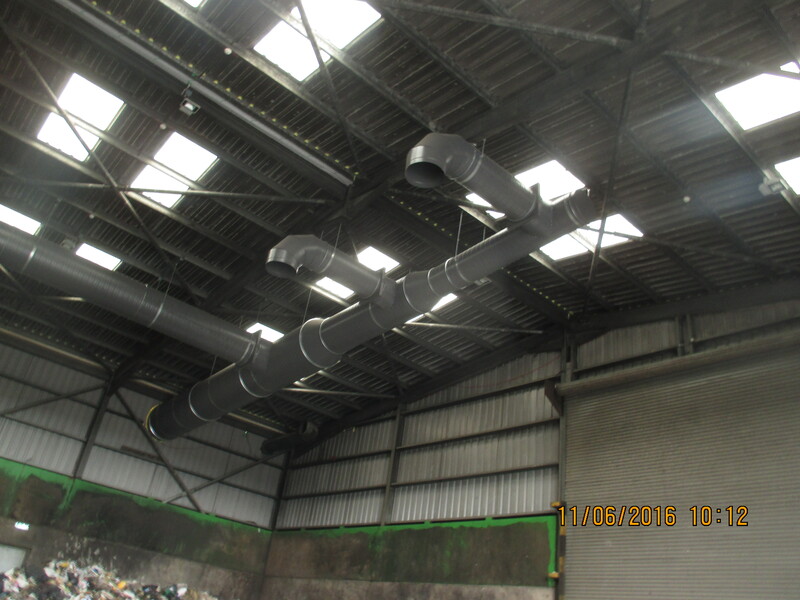 The odour control system consists of a ventilation system to extract the odour from the process hall. The extracted air is passed over a prefilter to remove impurities after which an activated carbon system removes the odorous compounds. Special attention is given to the air tightness of the building, ventilation rate and extraction points. 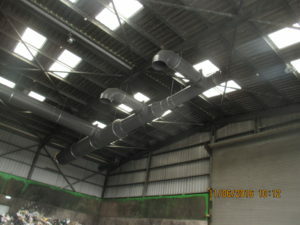 It is preferred to ventilate through a local extraction point, just above the most emitting odour sources, such as the reception of the fresh waste, the shredders and drums,… To achieve an adequate ventilation system, a certain ventilation rate (sufficient number of air changes) is required to keep the process hall under negative pressure and to avoid unwanted odour emissions. In an airtight building, the negative pressure can be established with a lower ventilation rate than in a more open building. Ventilating the process facility can have some additional benefits for the plant itself since it will improve the indoor climate. The humidity in the hall will be controlled and the corrosion caused by the combination of moisture and corrosive gasses will be reduced. 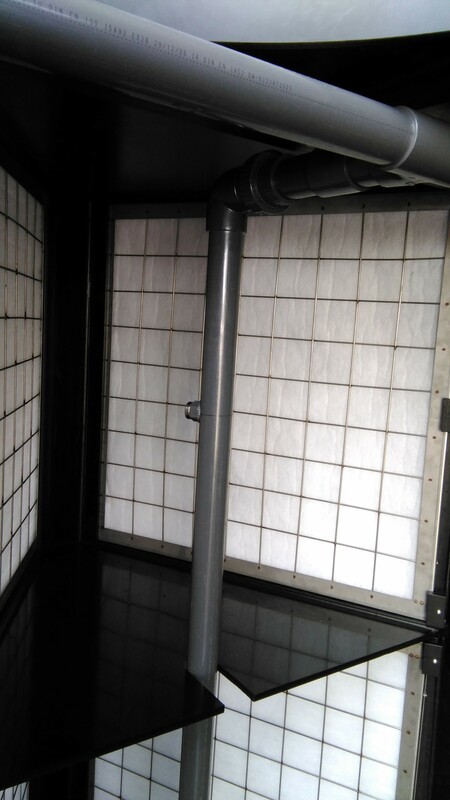 The vented air is passed through a dust filter which removes impurities, debris and oily mist from the air before it enters the carbon system. The prefilter is designed with great care to avoid early clogging. For cleaning purposes, the prefilter is equipped with a spraying system. By means of a pressure measurement, clogging of the filter is detected and immediate action can be taken by automatically spraying a detergent solution on the prefilter to remove dirt and fat. Fine filter systems like sleeve filters are less suitable in solid waste plants because of the fine structure and the higher pressure drop, especially since the air is contaminated with oil mist that cannot be removed from a sleeve filter. Within the waste processing plants, different types of odour can be distinguished. In general it is noted that the received waste is mainly emitting volatile organic compounds (VOC), e.g. ketones, fatty acids, … while the stored waste bales are emitting high concentrations of sulpfurous compounds ( H2S, mercaptans,…). To abate the odour emission of these different sources, IPEC NV has designed an odour control system that is capable of handling both VOC and H2S, based on activated carbon technology. The carbon used in our system is pelletized carbon, characterized by a low pressure drop and a high odour removal capacity. The carbon can be impregnated in situ to increase the H2S removal capacity, depending on the needs of the particular plant. The carbon is placed in a horizontal container with a spraying system on top. By means of this spraying system the carbon can be washed to avoid the clogging in case any impurities have passed the prefilter. The system is custom made, based on the size of the process hall and the odour load. It can be provided in 1 container processing a flow up to 70 000 m³/hour. Depending on the requirements, it can be highly automated and provided with scada or other controls which makes the system easy to operate.